The Run for the ‘L’ of it! 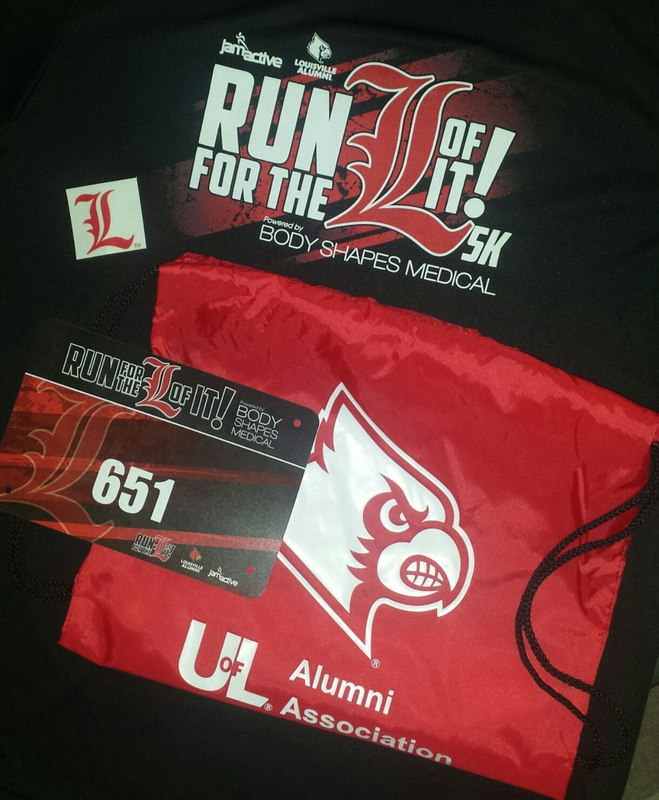 5k is an established event in Louisville. This year saw increased participation with a new and improved route. I made a deal with myself that if I PR’d last week, then I could take it easy for the ‘L’ of it. I switched up training and attended my 5:15 a.m. spin class on Friday. Normally, I always rest the day before a race. This was a little experiment to see how my body would react. 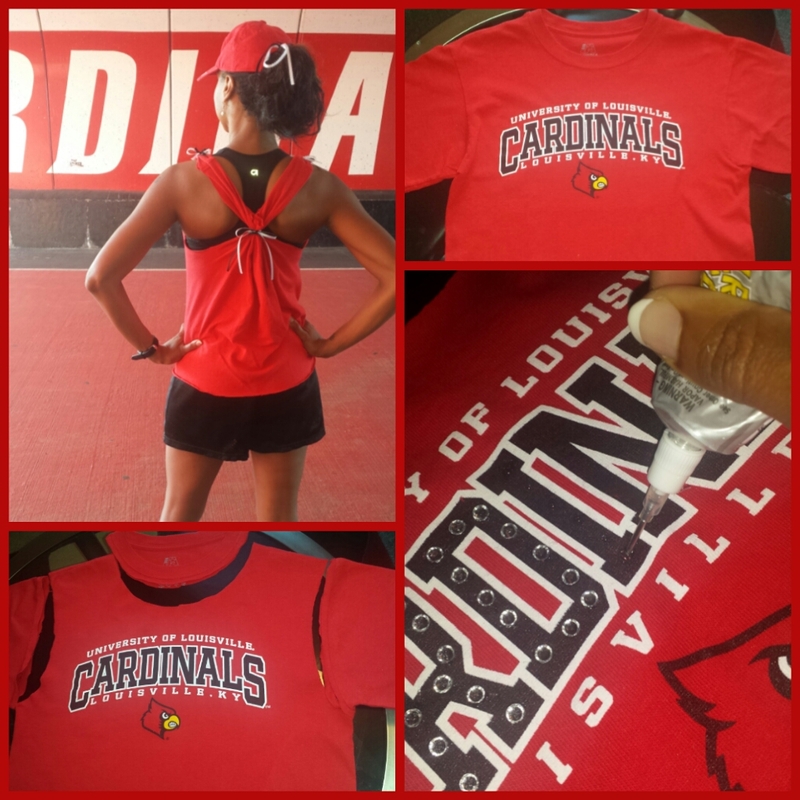 Another experiment was to cut up an unflattering t-shirt and turn it into something more feminine and practical for running. The location for packet pick up was a bar and grill called Brownies the Shed. 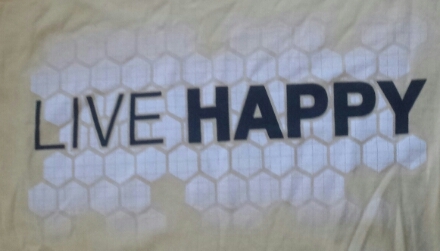 Very nice race swag, however, I wish the shirt was gender specific. DJ K Dogg was blasting the jams while the cheerleaders hyped the crowd. Darrell Griffith, a key player in earning U of L it’s first NCAA basketball championship in 1980 gave the official start. There was no timing mat which meant all results would be based on gun time. Not fearing any crowd, I was a split second behind the start. I had to dodge a few kiddos who would have killed it this were a field day 50 yard dash! Too cute. We turned out the parking lot and onto Floyd Street. Its a straight shot to mile marker 1 located between the Card’s Natatorium and the Track & Field. Note to self: I’m not feeling explosive. Run anyway. I was passed by a few men and two women. I was able to catch a young lady who I could tell runs Cross Country. She powered up to pass me as I held my pace. Another lady passed both of us and the younger girl powered up again but I knew she wouldn’t hold her pace. Note to self: Race against the clock, not other people. Keep it steady. 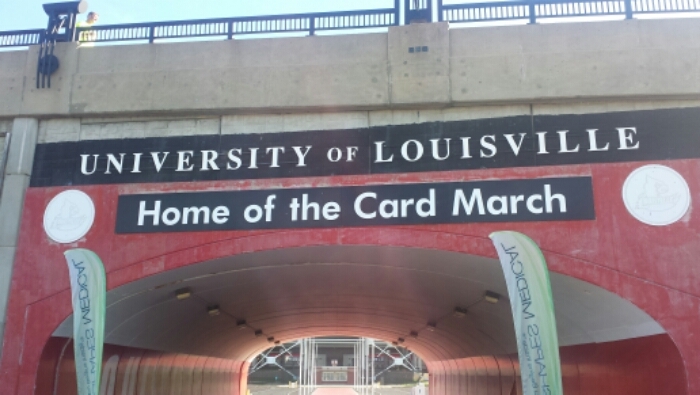 We exited the U of L sports facilities and made our way through the academic buildings on campus. There was a quick hill on Brandeis. I wanted a water stop but pushed onward. 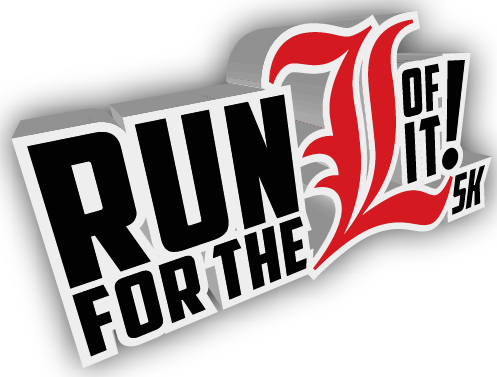 Between miles 1 and 2 were random facts about U of L such as: 94% of all new students have scholarships, 25.6 average ACT scores and 22k + students enrolled in Fall 2013. I was passed a few times on this stretch. There was a heavy breather over my left shoulder. Luckily, his breath smelled like Life Savers. I guessed the orange flavor. It was a straight shot down 3rd street besides a slight detour by the Schools of Law and Business. 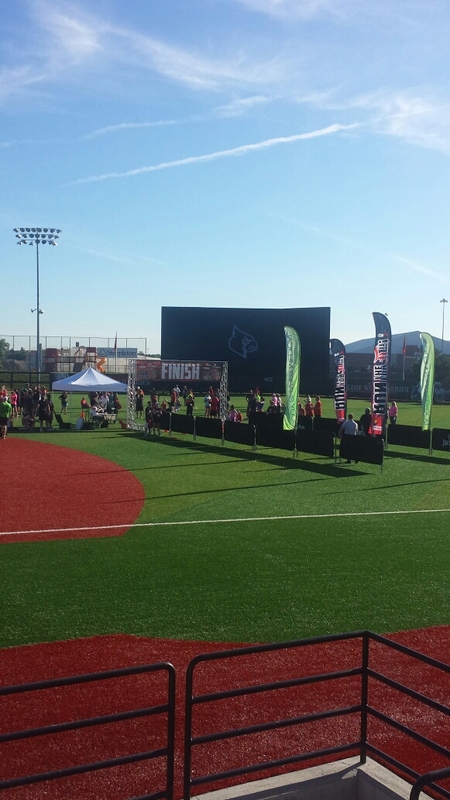 The Jam Active signs gave facts about U of L ranking 23rd in the nation for Law and #1 in KY for Business. I was interested in seeing The Thinker sculpture. All I could think of at the time was “how much farther?” There was a slight regret to not wearing my pink Garmin for fear of ruining perfectly coordinated gear. I was jealous of everyone’s watch notifications. I saw the traffic light at 3rd and Central. 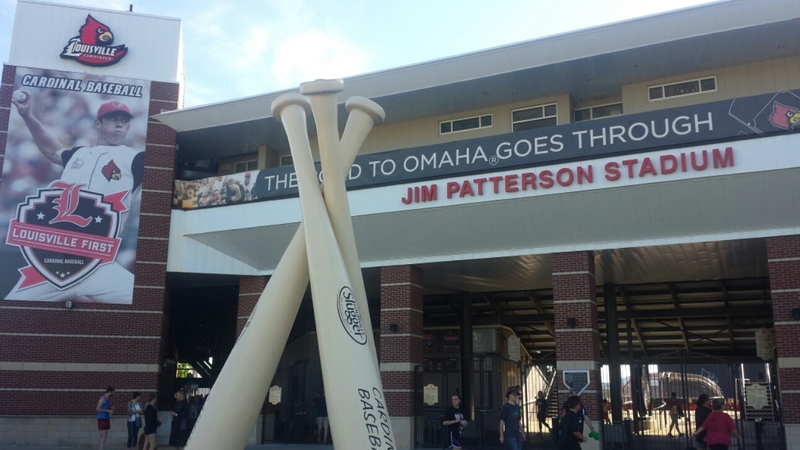 I didn’t know if the finish line would be there or inside Patterson Stadium. I approached some yellow cones that guided me inside. I wanted water immediately after I crossed the line. We had to walk off the field to reach the refreshments. Water, Gatorade, bananas, oranges and grain bars were amongst the selection. I never utilize post race massages so I gave one a try. It was a nice reward. Body Shapes Medical gave out cute shirts. I observed a Run for the ‘L’ of it backdrop and knew I had to jog back to my car and get my phone. I checked the results and saw I was 36th overall finisher. Something told me to glance at the results again. I counted the number of females ahead of me. I was guessing I was #7-8. To my surprise I was #4!!! 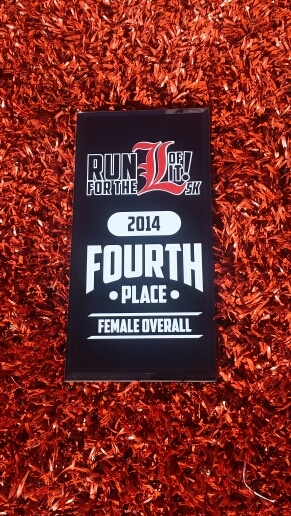 This was a huge deal because prizes were being awarded to the top 5 overall men and women. Instead of snapping my photos and leaving, I would need to wait around for the awards. I talked with the lady who placed 3rd. She is from Lville but lives in Atlanta. We talked about hill training and upcoming races. The DJ was still jamming and people hung out to take photos. At 9:00, they announced the winners. 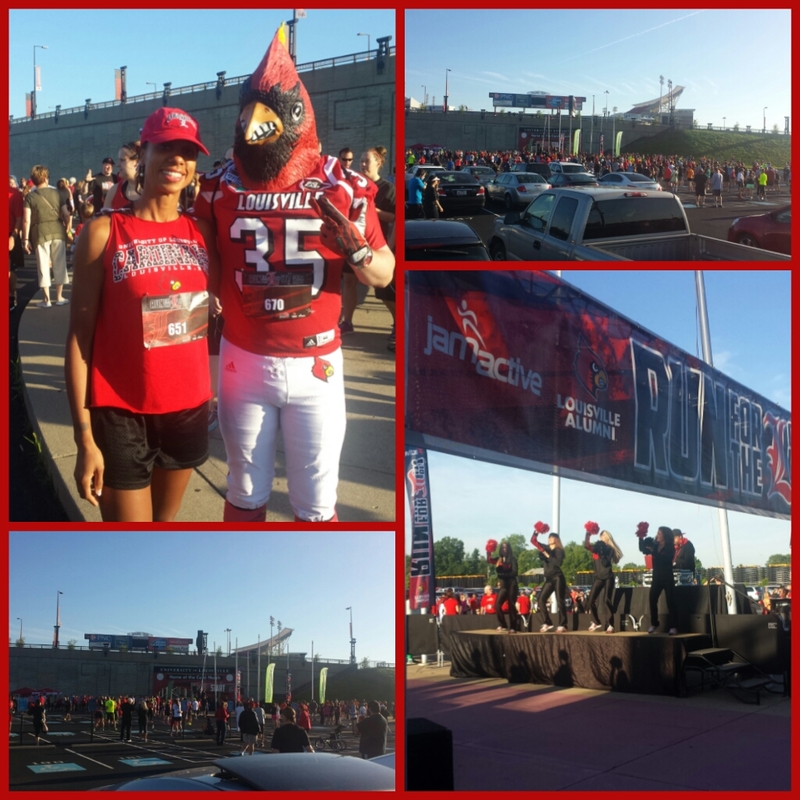 I was the only Top 5 woman in Cards gear! I am so glad I went back to the finish area. This 4th place award was so unexpected. My time was about a minute slower than last week’s 5k. I believe my performance was more mental than physical. I didn’t set a PR goal, so I didn’t push for one. I jogged to the car and still had enough juice to go to the Y and do a legs circuit. 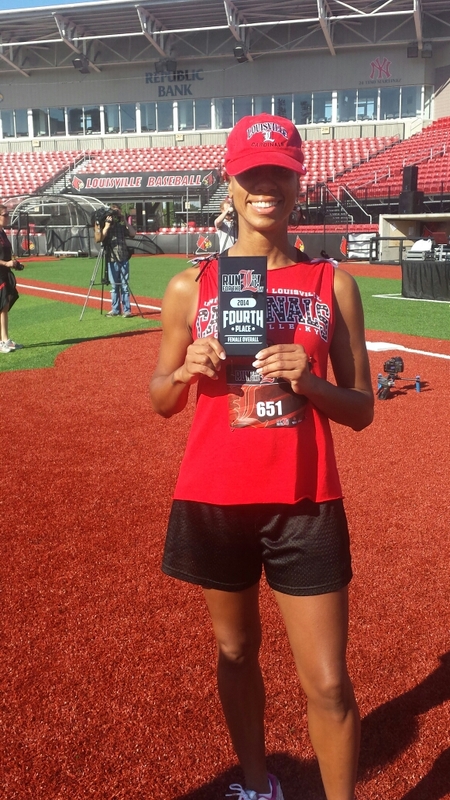 This entry was posted in fitness, Louisville, running and tagged Run for the 'L' of it! 5k. Bookmark the permalink. Congrats! You look great and so happy! Thank you Elizabeth! I felt a great sense of achievement. Sweeeeet! Way to go! Looks like a fun race, and I like all the graphics they designed. Again, congrats! Thanks Scott! I can’t wait to read about your 10k! Finishing in Style ! Congrats. Thank you Steve! 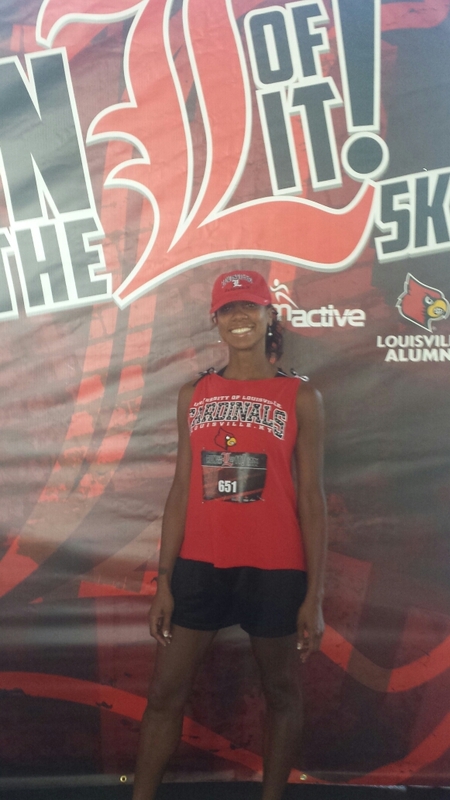 The U of L Alumni Association and Jam Active put on a great event.